A command performance, a hard fought win, the outcome the same; the two most celebrated players on duty in the Women’s Singles event at the Seamaster 2018 ITTF World Tour Platinum Australia Open booked their places in the final as a result of their efforts in Geelong on the evening of Saturday 28th July. Ding Ning, the no.7 seed, beat Japan’s Kasumi Ishikawa, the top seed, in four straight games (11-8, 11-7, 11-7, 11-8), the win coming after Chinese national teammate, Liu Shiwen, the no.2 seed, had eventually ended the adventures of colleague and qualifier, He Zhoujia, in a six games encounter (7-11, 11-5, 11-6, 5-11, 11-6, 11-7). Ding Ning was simply imperious; she controlled proceedings from start to finish and thus maintained her unblemished record against Kasumi Ishikawa. It was the 12th meeting between Ding Ning and Kasumi Ishikawa in a world ranking event; only once has Kasumi Ishikawa extracted more than one game from her fellow left hander; that was two at the semi-final stage of the 2014 Women’s World Cup in Linz, Austria, when a six games verdict was the order of the day. Somewhat differently for Liu Shiwen, it was reversing the trend. 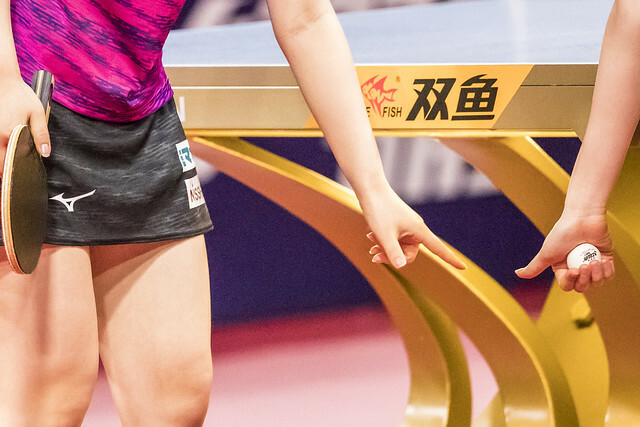 Just over two months ago on the Seamaster 2018 ITTF World Tour in Hong Kong, He Zhuojia had beaten Liu Shiwen at the quarter-final stage in a closely contested seven games contest (11-9, 11-5, 3-11, 5-11, 11-9, 6-11, 11-9). In Geelong, Liu Shiwen extracted revenge in six games (7-11, 11-5, 11-6, 5-11, 11-6, 11-7). “This is my first time in Australia, it’s a very scenic place and I’m happy to be here. I’m very happy with my win today, especially because I lost to Zhuojia earlier this year at the Hong Kong Open. The match today was also not easy, so it feels great to be able to win.” Liu Shiwen.